DisasterReady - NGO-approved online training for Humanitarian Workers and Volunteers. 100% Free. Trusted by more than 130,000 humanitarians and developed in collaboration with leading aid agencies and humanitarian experts, DisasterReady.org makes cutting-edge professional development resources available to relief and development workers and volunteers - anywhere, anytime, at no cost. DisasterReady.org’s online learning library of more than 1,000 training resources is constantly expanding and covers core topics such as Humanitarianism, Program/Operations, Protection, Staff Welfare, Management and Leadership, Staff Safety & Security, and Soft Skills. 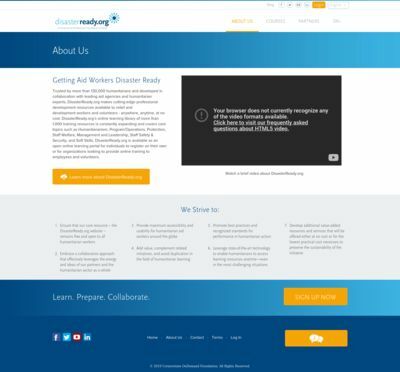 DisasterReady.org is available as an open online learning portal for individuals to register on their own or for organizations looking to provide online training to employees and volunteers.